Downy mildew of blackberry (Rubus sp.) is a systemic disease caused by the fungal-like pathogen Peronospora sparsa. Nearly all blackberry cultivars are susceptible to downy mildew. 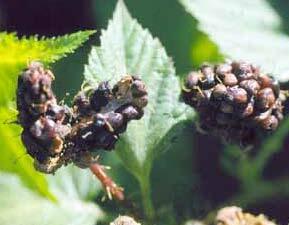 The disease also occurs on boysenberry, youngberry, and rose (Rosa spp.). 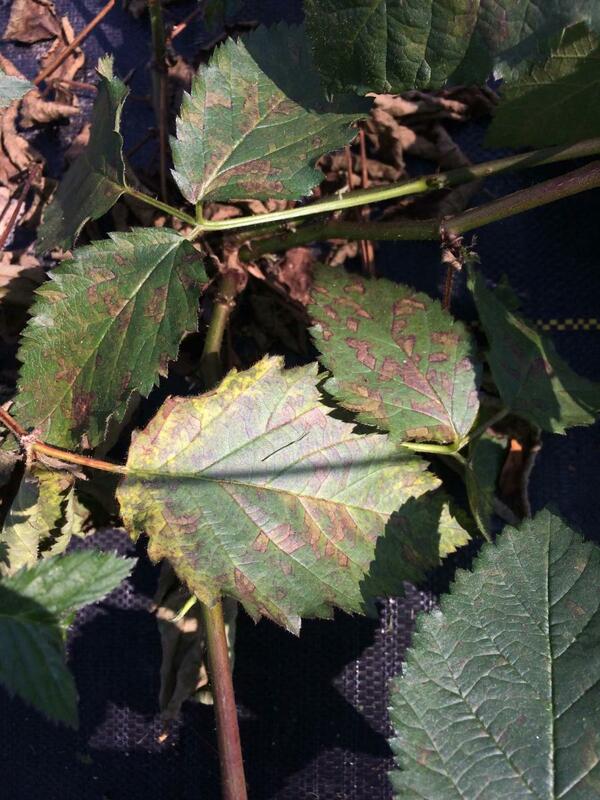 Downy mildew affects both the leaves and fruit of blackberry, although leaf symptoms are most common in Ohio. Stunting can occur in infected plants even when foliar symptoms are not visible. Disease is most severe during wet weather with cool to warm temperatures. Figure 1. Downy mildew symptoms on blackberry (cv. Ouachita). Plants are stunted and leaves have angular reddish-brown spots. Downy mildew is most prevalent during wet weather at temperatures between 65 to 75 degrees Fahrenheit. The pathogen produces spores (sporangia) during cool, wet nights on dense leaf patches on the plant or at the base of the plant. The spores are dispersed by wind to new foliar growth and/or berries. Symptoms first appear on the upper side of the leaves as yellow irregular-shaped spots (lesions) (Figure 1). As the lesions age, they turn a reddish brown to purple color. Leaf lesions are usually located along the midrib and major veins, giving the lesions an angular appearance. White to gray colored spore masses develop on the underside of each lesion and can be seen with the naked eye, although spores are often sparse (hence the name of the pathogen–P. sparsa). If favorable conditions persist, the lesions expand to cover the entire surface of the leaves, and eventually the leaves turn brown and drop to the ground. Infections on the fruit, sepals, and pedicels also occur, but are less common in Ohio. Early disease symptoms on berries include a loss of shine and split fruit. The fruit eventually become dry and shriveled but remain attached to the plant. The disease on the fruit is referred to as dry berry or dry cell syndrome (Figure 2). The pathogen survives the winter as mycelium (strands of the pathogen) inside roots, crowns, and canes. The production of a second type of survival spore (oospore) has been reported in some regions of the United States but not Ohio and may contribute to new infections in the spring. 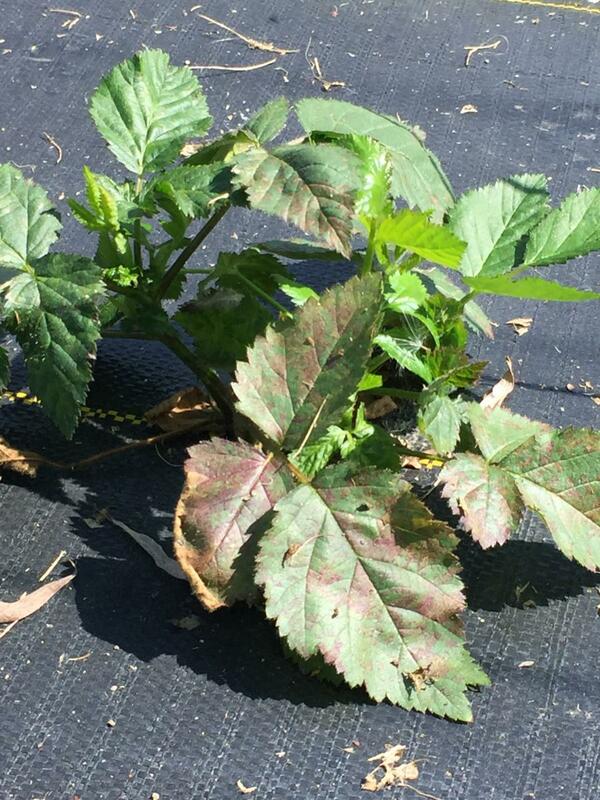 Management of blackberry downy mildew requires an integrated approach. However, because there are no resistant varieties and the disease is systemic, the use of fungicides is critical to prevent the spread of the disease to developing fruit. While there are no resistant varieties, the following varieties have been reported to be moderately resistant to downy mildew: Chester, Arapahoe, Apache, and Navaho. Plants should be purchased from a reputable nursery and inspected for signs or symptoms of downy mildew before planting. Early symptoms include light green to yellow leaves with brown to red colored spots, stunting, and red streaking on the stems and petioles. For new plantings, select a site that gets direct sun for at least eight hours and place plants so that air can move easily through the plants. Avoid planting near wooded areas with wild blackberry bushes or roses as these can be a seasonal source of downy mildew spores. Once the planting is established, remove suckers and weeds at the base of the plants to promote good air circulation. Use drip (trickle) irrigation systems rather than overhead irrigation systems. If overhead irrigation systems are used, apply water early in the day to allow for adequate time for the leaves to dry before sunset. Use recommended rates of nitrogen only. Excessive nitrogen can increase downy mildew susceptibility. At the end of the season, prune out and destroy old fruiting canes to reduce new infections in the spring. Diseased plant material should not be composted. The application of fungicides is the primary method to manage downy mildew in commercial plantings where the disease has been confirmed. To have downy mildew confirmed, contact the C. Wayne Ellett Plant and Pest Diagnostic Clinic (ppdc.osu.edu or 614-292-5006) or your state fruit pathology specialist. Figure 3. 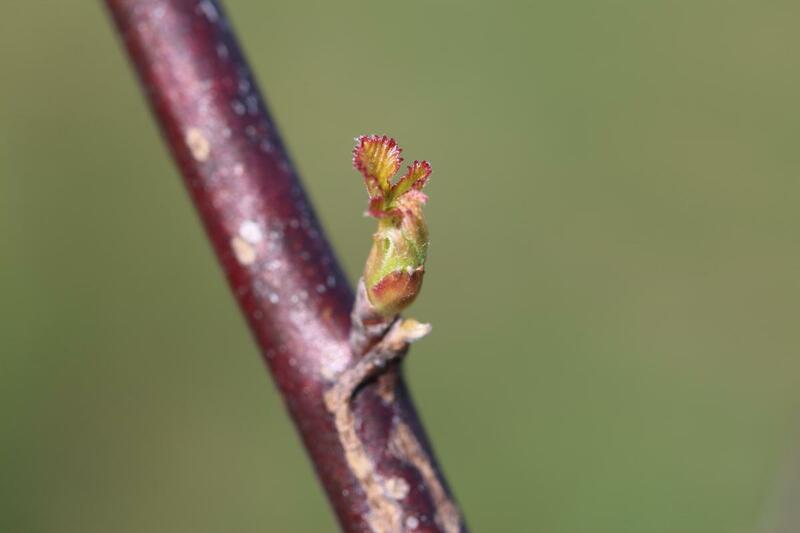 Blackberry at the early bud break stage. Photos courtesy of Gary Gao, The Ohio State University South Centers. 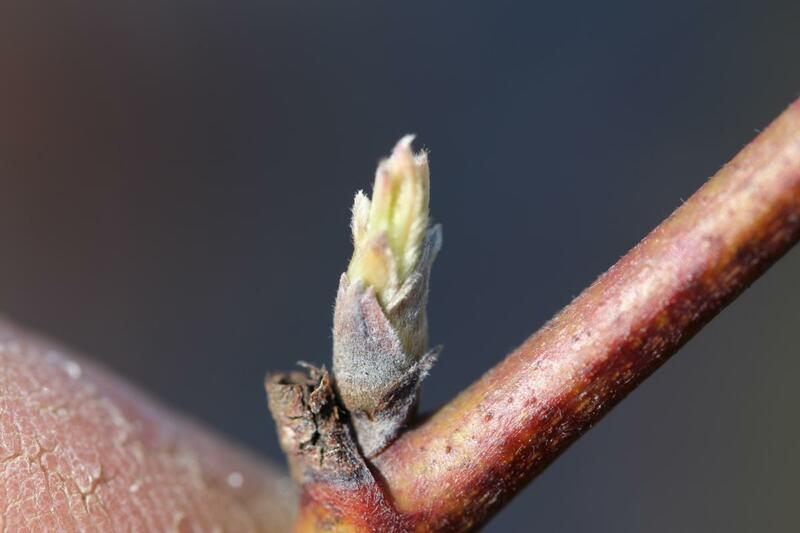 Fungicide applications should begin at bud break (Figure 3) and continue through fruit set at 10 to 14 day intervals. Fungicides containing mefenoxam or potassium phosphite will provide the best level of control. Applications of potassium phosphite can result in phosphorous deficiencies, therefore a balanced nutritional program should be followed and monitored. Contact your county Extension office for fungicide product and rate recommendations. Currently there are no biocontrol products that are effective in controlling downy mildew.